You might be new here and coming from Traci’s awesome blog “Beneath My Heart“. So a big warm welcome from me. I hope you enjoy what you see. Last year (click HERE) I went all out with Fall and Halloween decor but this year things are a little different around here for various reasons. Some are not so good because of our time-consuming personal struggles (click HERE to read) and some are awesome but I can’t talk about it yet. I promise I will if it comes true. I think I had a theme this year to work with what we had and spend a minimum of money. I accomplished that this Fall as well by simply switching things around that I had already. All I did for fall is move some pillows throughout the house into the living room. 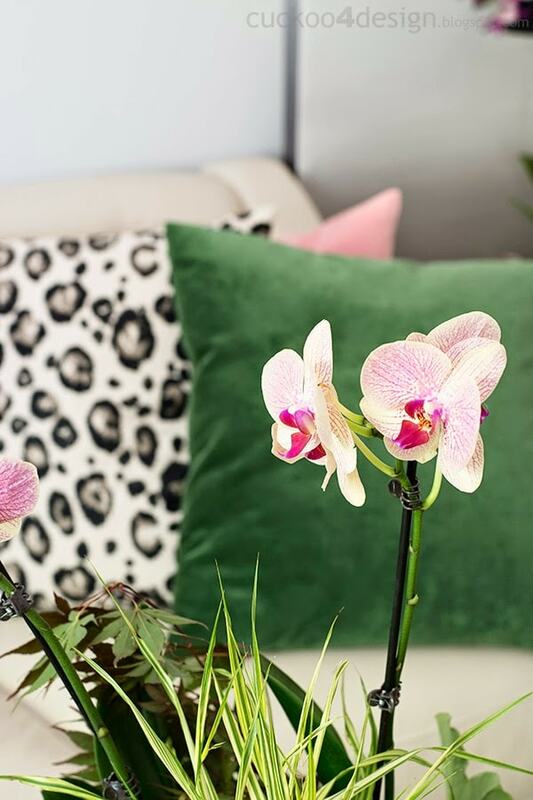 The leopard H&M pillows were in my daughter’s room, the Schumacher Chiang Man Dragon pillow was always in my bedroom but nobody ever really saw it in there, so why not move it in to the living room? The colors are perfect for fall. I also added some greenery from our garden. 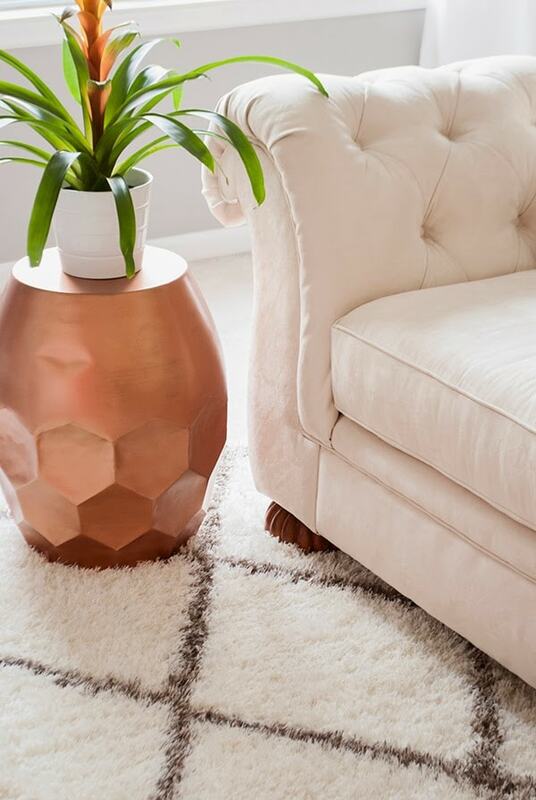 I just had to get the Nate Berkus pouf after they marked it down to $17something, finally! I really didn’t need it, hey I didn’t even really have room for it but I love it. which is over 100 years old looks perfect with the fall decor. There are cats snuggling everywhere in my house. Especially when it gets chillier outside. 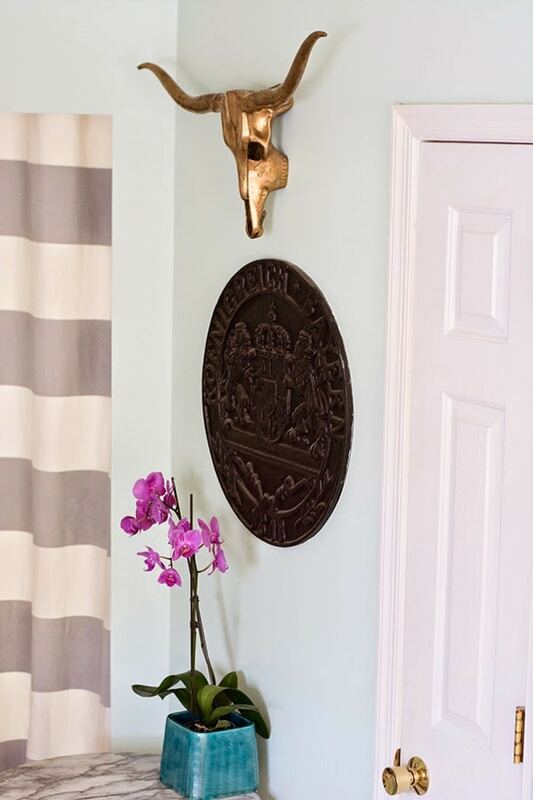 Click HERE to read more about my hallway makeover. 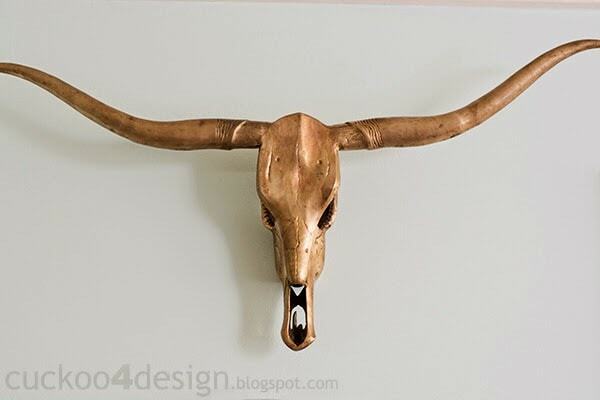 I finally hung up my new brass skull in the kitchen. Read more about our kitchen HERE. Click HERE to read more about this pumpkin. Yup, minimal pumpkin action in the dining room for this year. 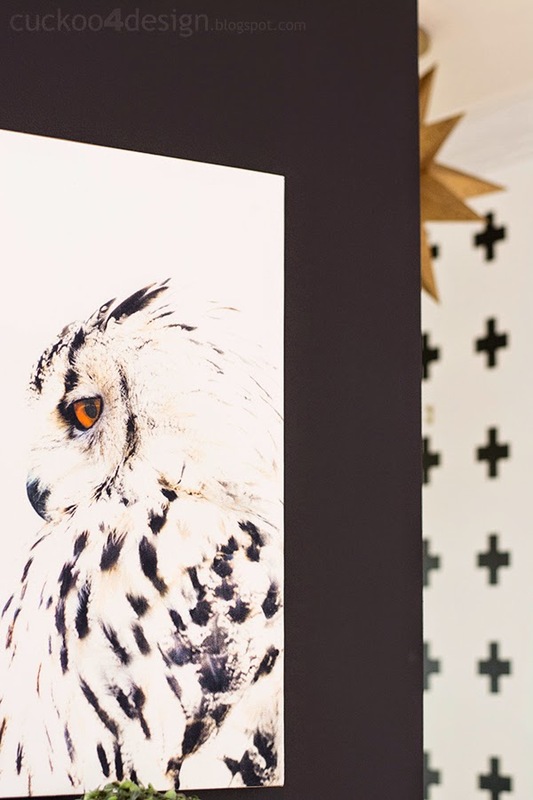 But you can read about my painted curtains and my gallery wall HERE and HERE. Click HERE to read how I reupholstered this chaise. 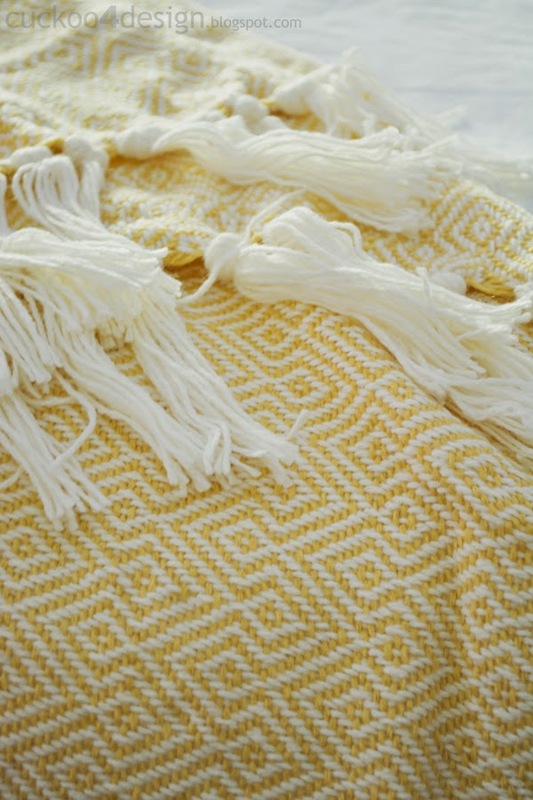 Here is the throw I bought and hurry if you want one, because it’s on sale for $17.99 right now. My 19 year old Manx cat in her favorite spot. And nope that’s not the same cat as before but they do look very similar. 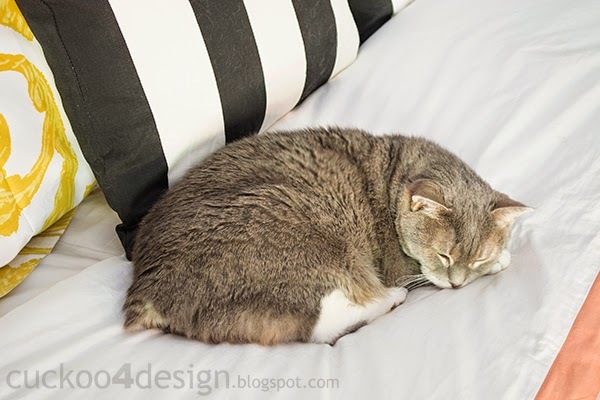 For fall I reversed her Ikea comforter to show some plaid instead of the stripe. 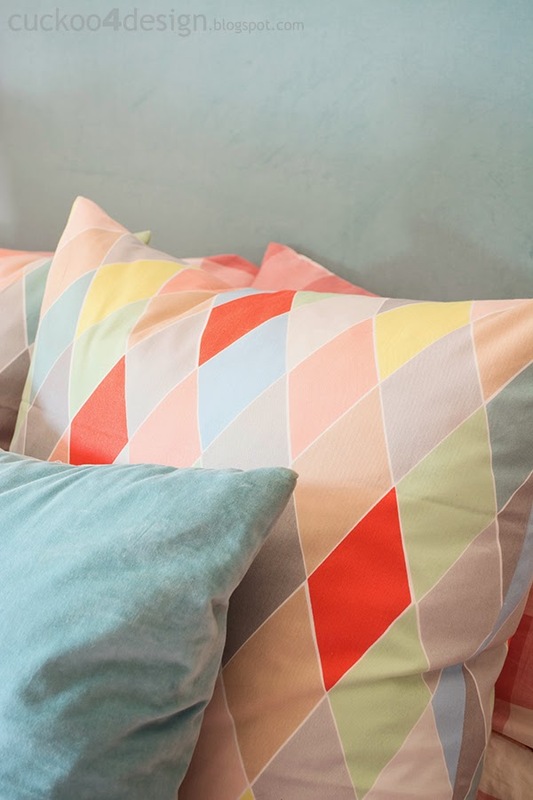 I got my daughter these fun diamond patterned pillows at Ikea in Germany for $4. I haven’t seen them around here yet have you? 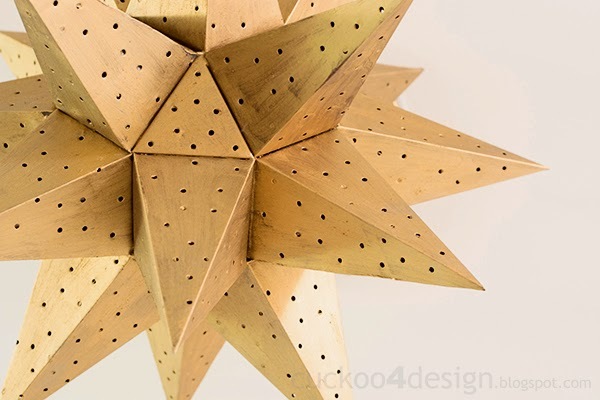 I know, I know…not really a fall decor addition but I really like them and though I’d share them with you. 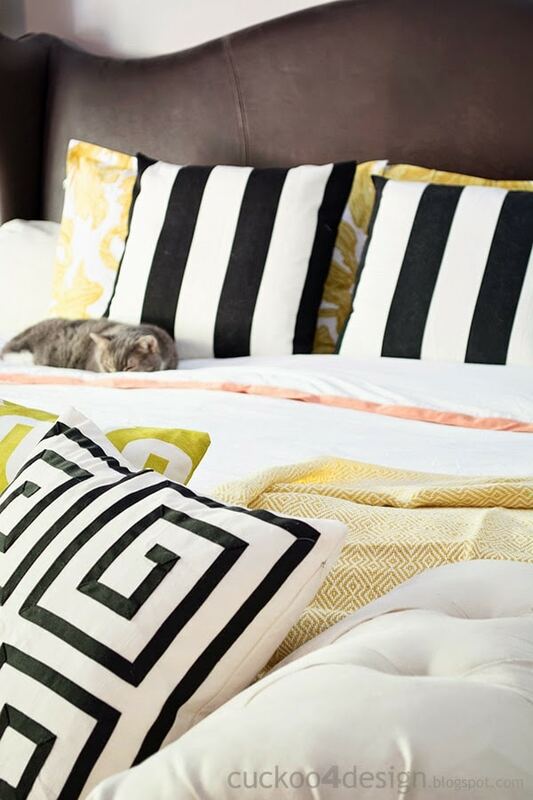 You can read more about how I made her bed by clicking HERE). 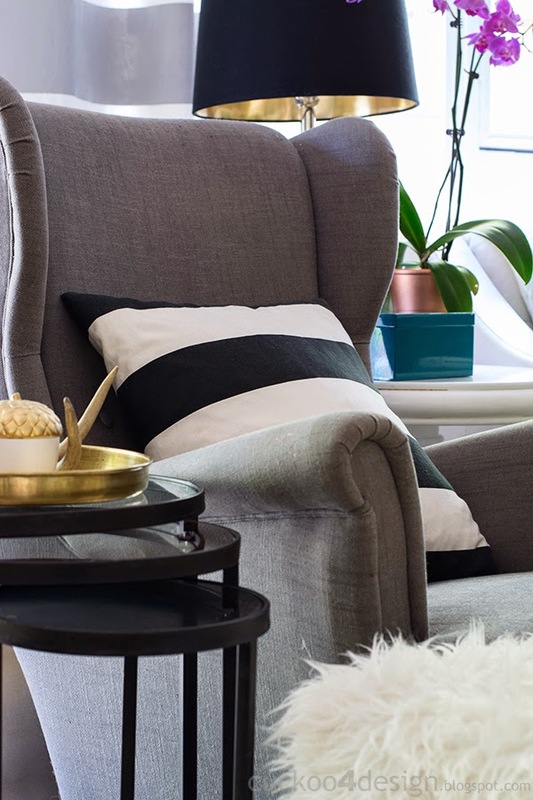 And before you leave I just wanted to show you how I simply switched out my summer look for the fall look by replacing flowers and pillows to make it a little more cozy. I hope the animation doesn’t take too long to load. Let me know! pay her a visit to keep this blog hop going by clicking HERE. Ha, that little gif is so fun! Thanks so much, so it didn’t take too long to load? 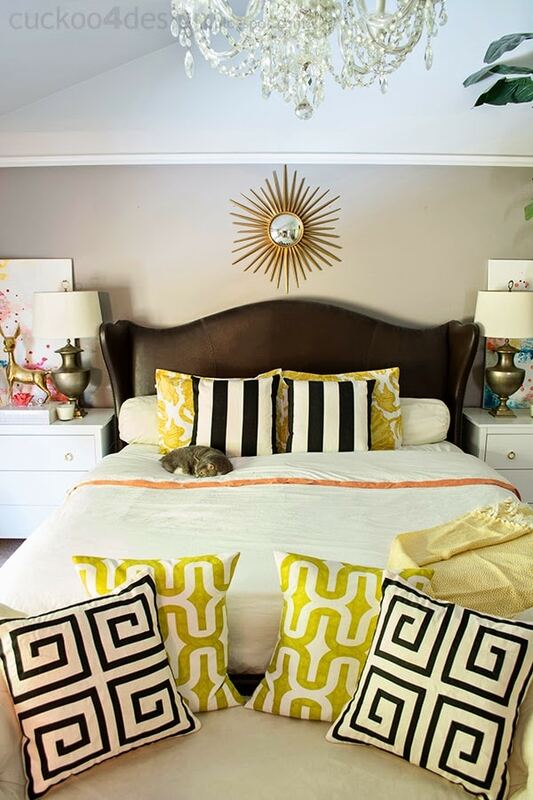 it’s amazing what pillow changes will do for a room to bring it into this season- LOVE the leopard! 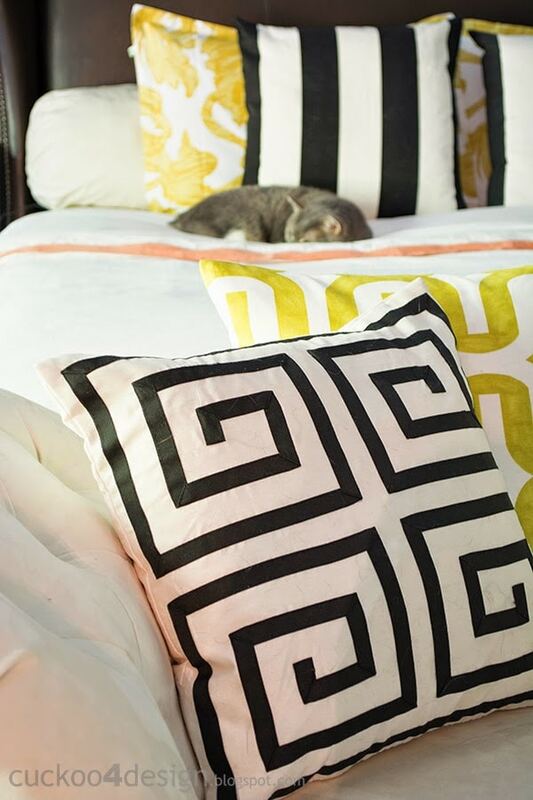 and love lily’s new pillows- fab! and of course everything else. 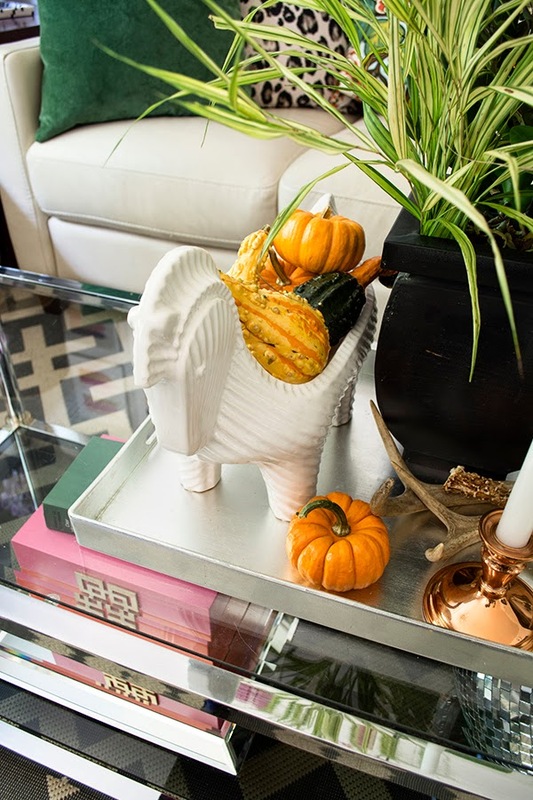 😉 and the mini pumpkins in your horse…. 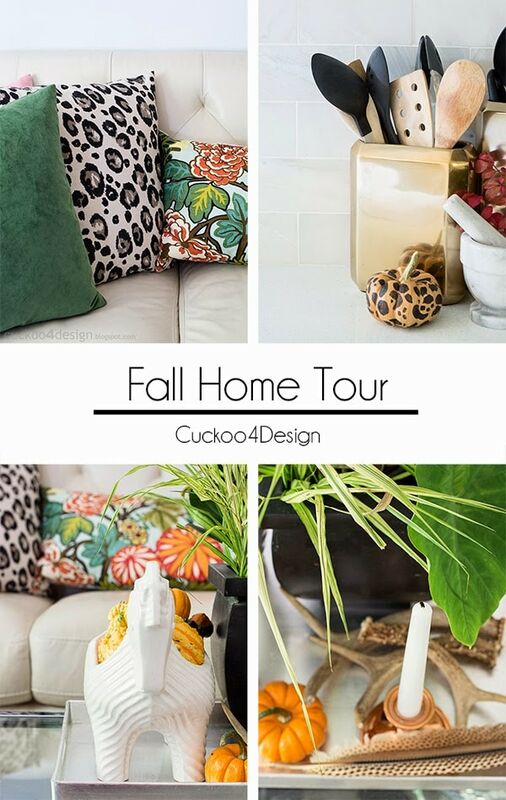 your home is fall in a very you way! 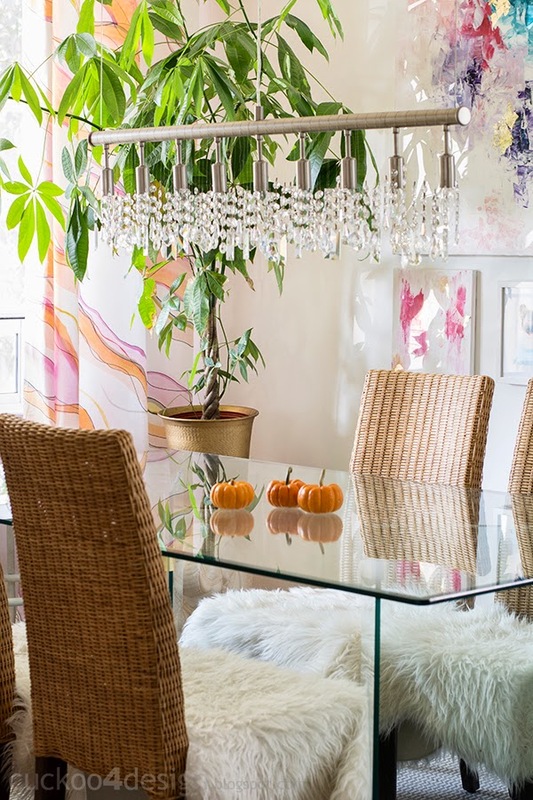 Julia I love your Fall decorating! It seems like a lot of us have gotten the minimal decorating feeling this year and I am loving it! 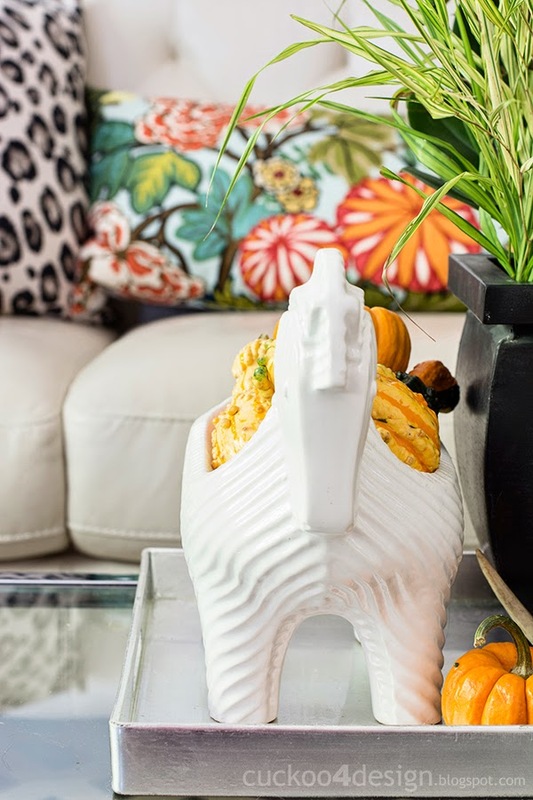 Sometimes Fall decor can be over done and we all have busy lives! I have had my eye on that NB pouf forever too and almost picked it up! Maybe I will go see if it’s still there… Also the animation is killer. 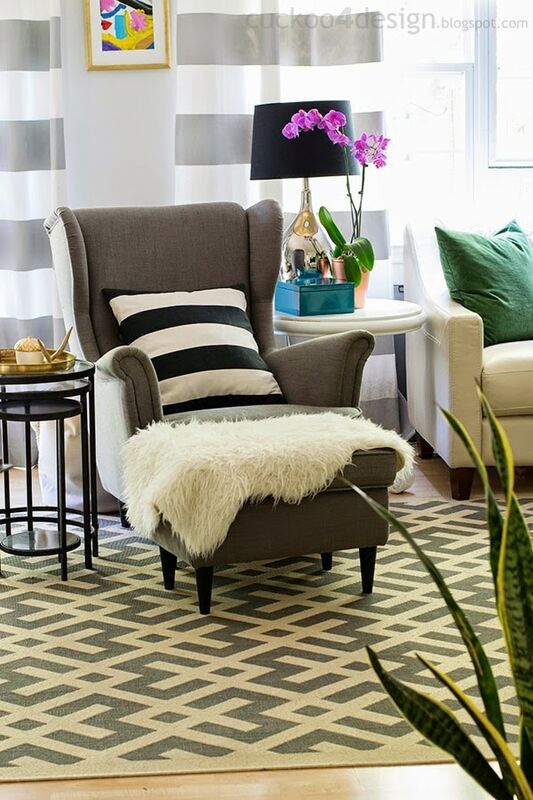 Very cool to see the simple changes transform the room! Love the new pillows, throw and that brass head! Looks so good! You have a truly lovely home Julia no matter the season and i prefer a lightened up version of Fall myself. Hey Julia! 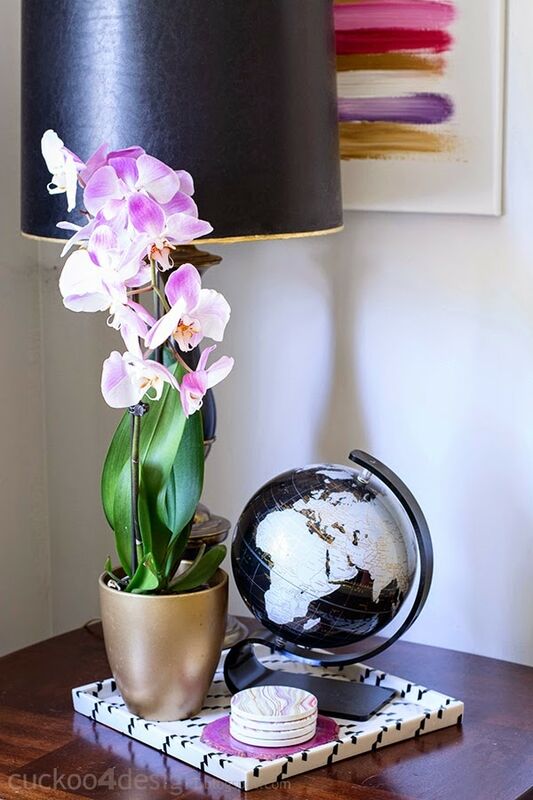 Your home always looks beautiful! 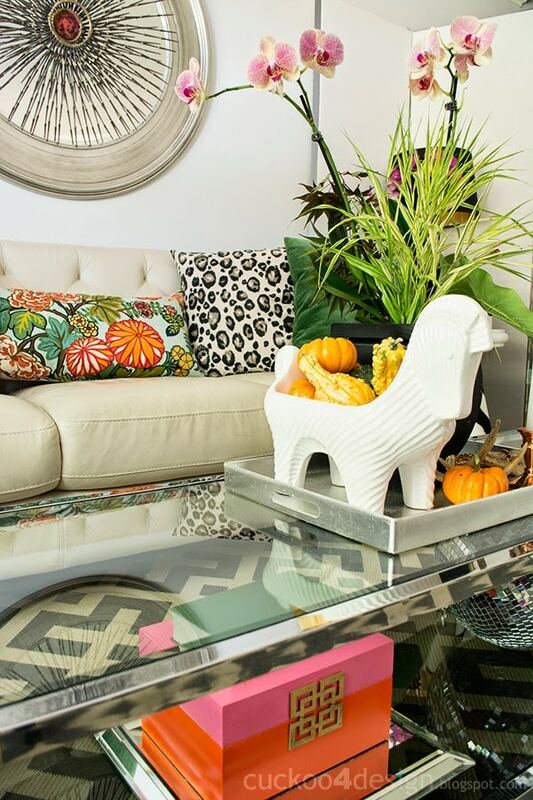 Love the little changes, love that leopard pumpkin and I’m seriously jealous over your $17 pouf! The gif is working perfectly fyi! Beautiful job! 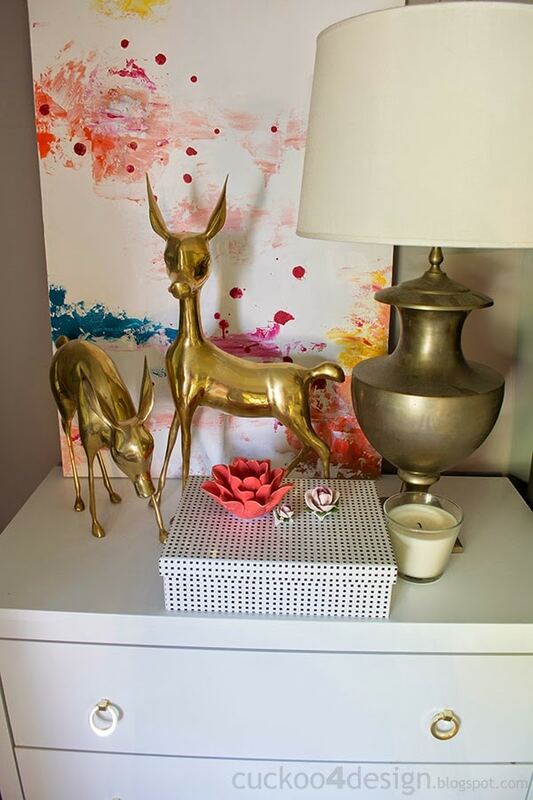 I love all of your gold accents and eclectic mix of pretties. Such a great tour Julia! 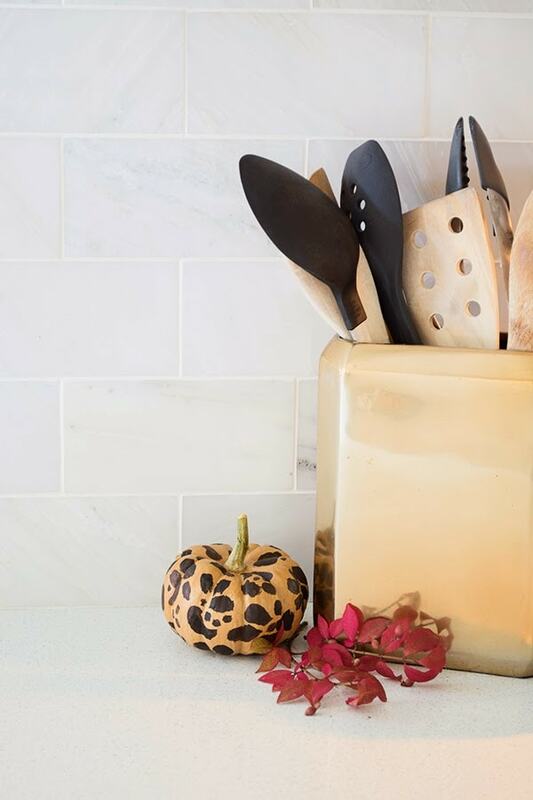 I loved the gold and copper accents and the little leopard pumpkin! The kitties are great accessories too! Love! 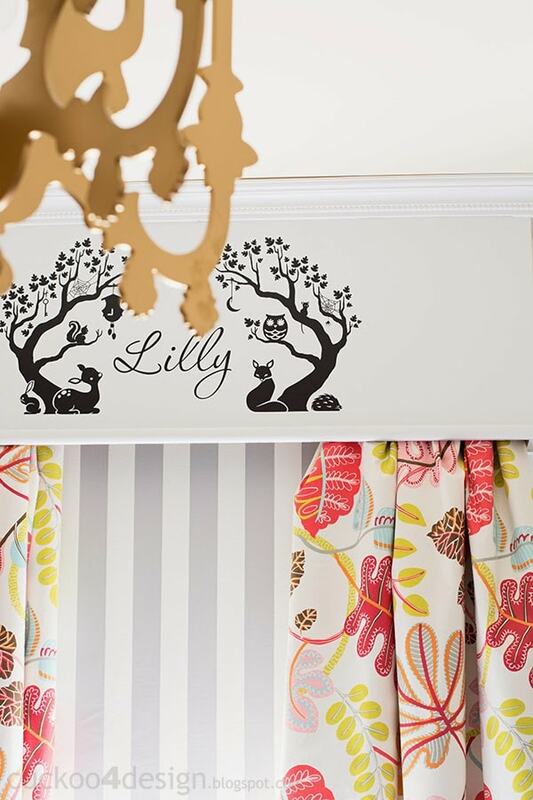 So pretty Julia, that little leopard pumpkin is my fav!! Wow, you got it all in! The video was fun to watch! 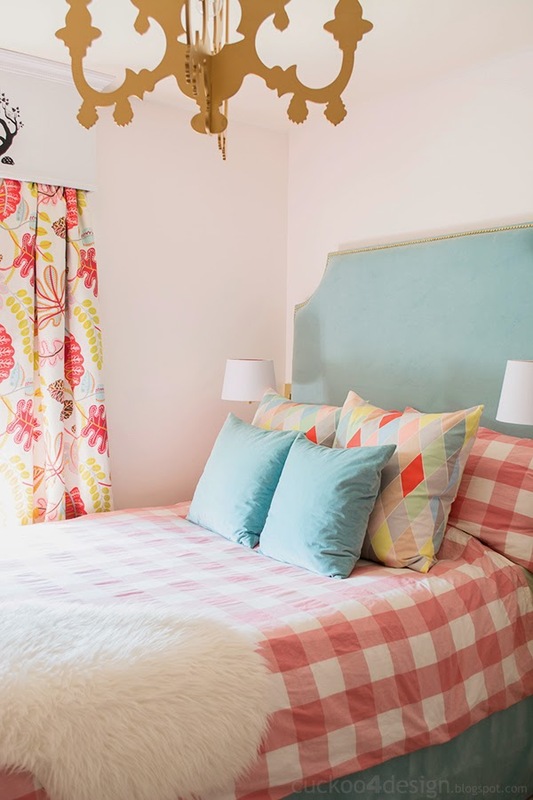 Oh I love how you use pattern and color for such a fabulous and inviting space. The change from summer to fall is gorgeous. Hi and thank you! Yes, I bought the fabric through a friend who had leftovers. Did you try ebay? Love that GIF! And $17 for that pouf?! Makes me wanna run out to Target just to check if they have any new Nate markdowns. Great tour, Julia! Julia, how is your home just more lovely every time I see it? 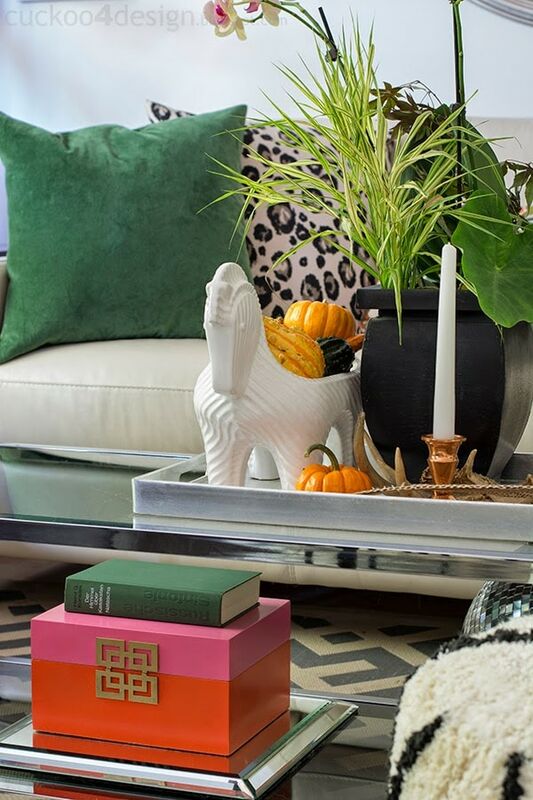 Love your change-up for Fall, and you know I’m really loving those green velvet pillows! Beautiful tour! 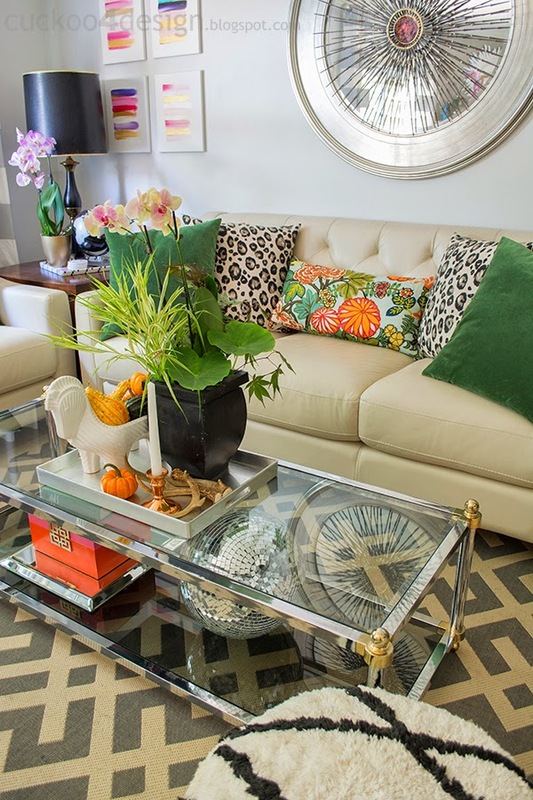 Those green pillows are perfection – for fall and all year long! In my opinion anyway!! Everything is gorgeous, Julia! I love your living room!! If I could steal everything, I would! 🙂 Maybe I can recreate a similar look if/when we buy a new house. 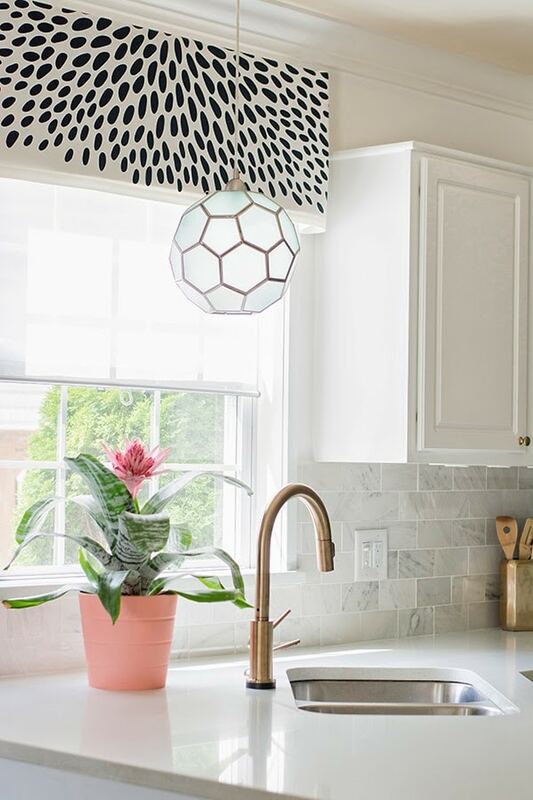 All the colors, textures, and fun accessories just speak to me! Awww thank you so so much Megan! Stunning! I love that animation too -so fun to see it go through the transition from summer to fall!! 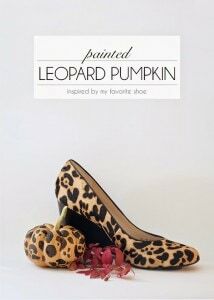 I love that animation and the teeny tiny leopard pumpkin! Beautiful (as usual). 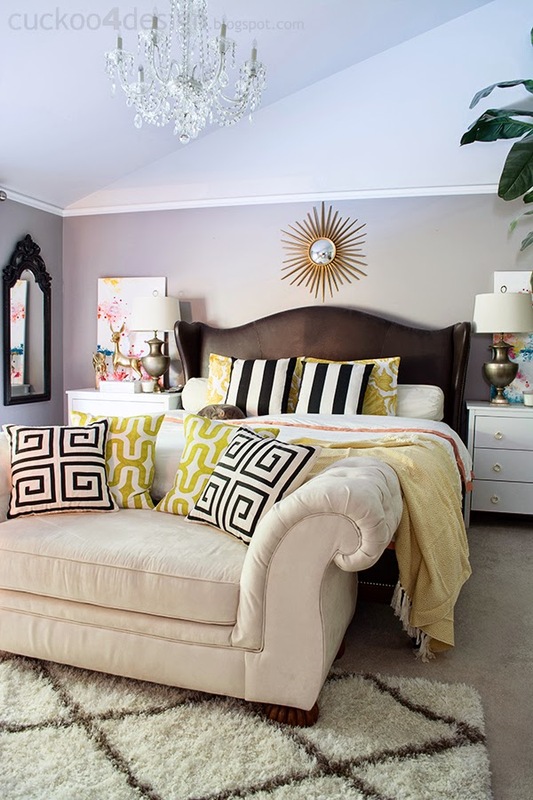 I love that gif at the end that shows how easy it is to update a room seasonally. Sometimes I think it looks complicated but really it’s just a few little touches! Oh, that little zebra (donkey? horse?) statue/container is to DIE for! Your house is so gorgeous! It looks amazing! Love the gif! 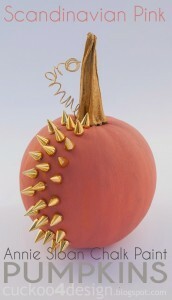 And that studded pumpkin is so bad @$$! 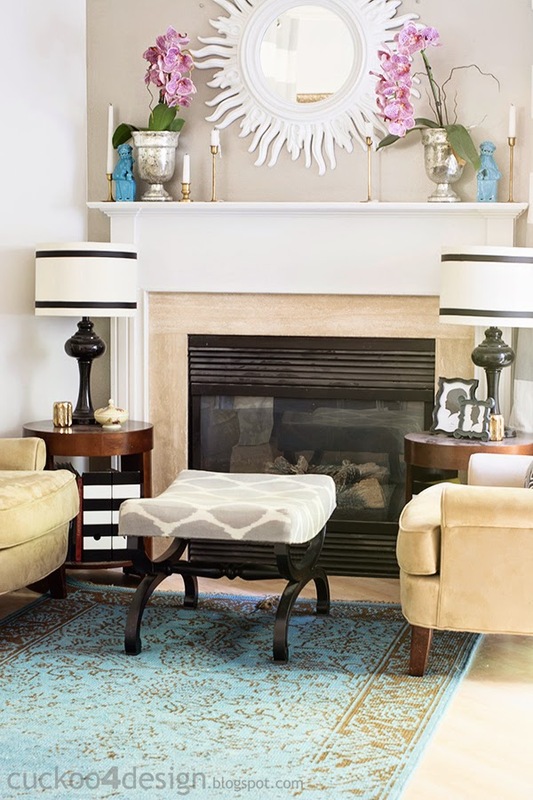 I noticed many new (to me anyway) items in your beautiful home. How you keep it so clean is beyond me…. and yes I saw the trip home arrival photos….. still you keep it together. Everyone has answered so much already. 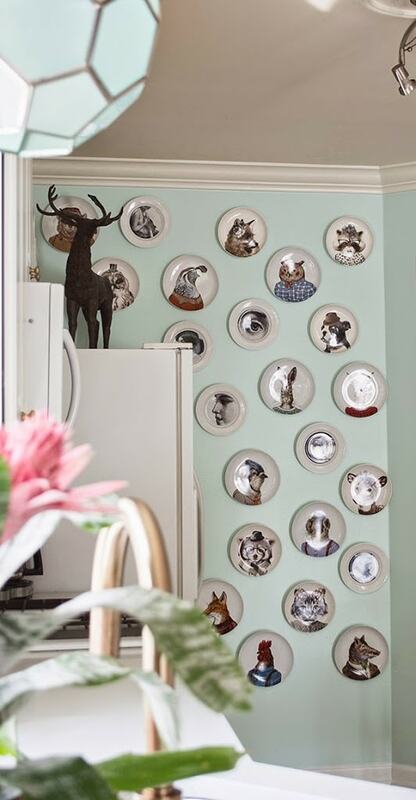 The only thing I can say is (to me anyway) is that a house is not a home without babies of some sort and you have several, especially the furry kind. 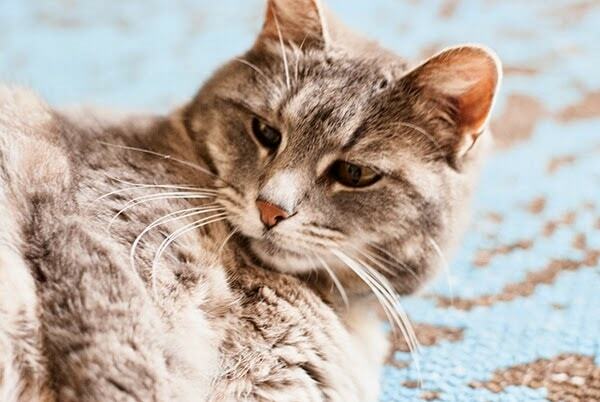 Julia – SWOON! It’s so gorgeous! And I can’t stop watching that wonderful animation at the end! I just love everything about this tour! Gorgeous tour Julia! 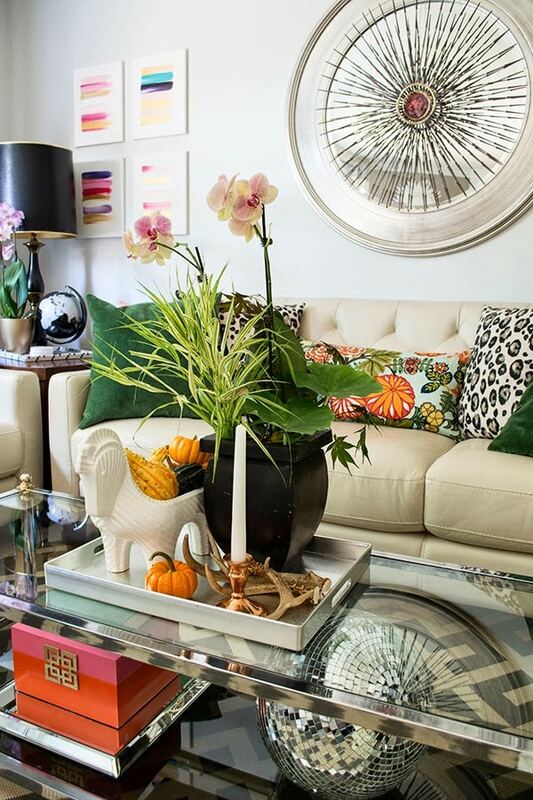 I love all the color and warm touches you added for fall! I declare you have one of the most beautiful homes! I loved the fall tour and the fact you kept it simple made it classy.. I love that gif of showing the transformation!! 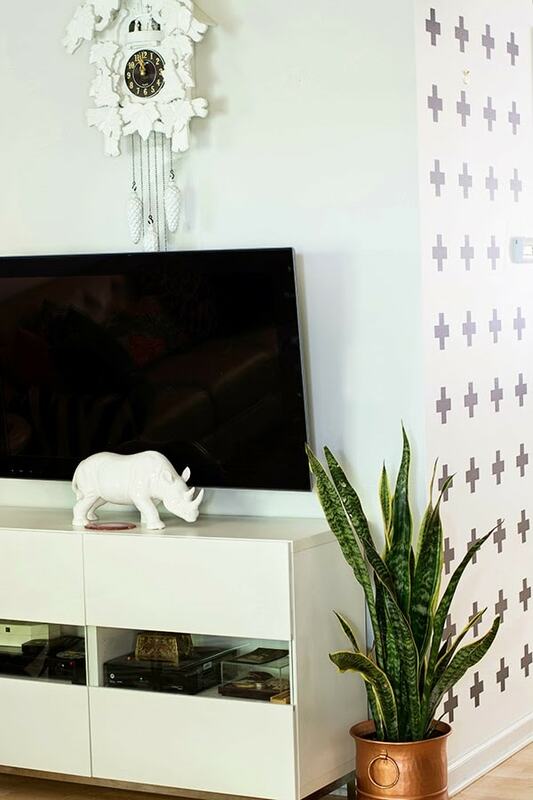 Seriously the living room (and the whole house really) is so gorgeous!! 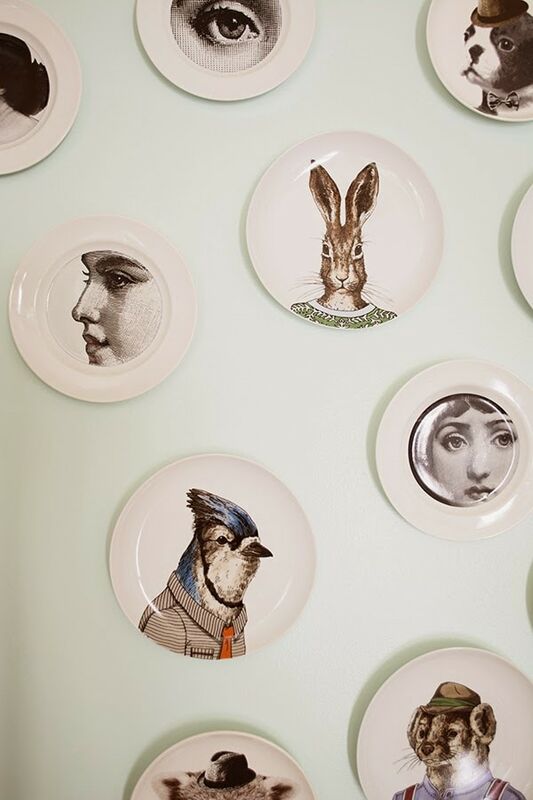 Love all the details. I’m also super jealous you got a Nate pouf for so cheap!! 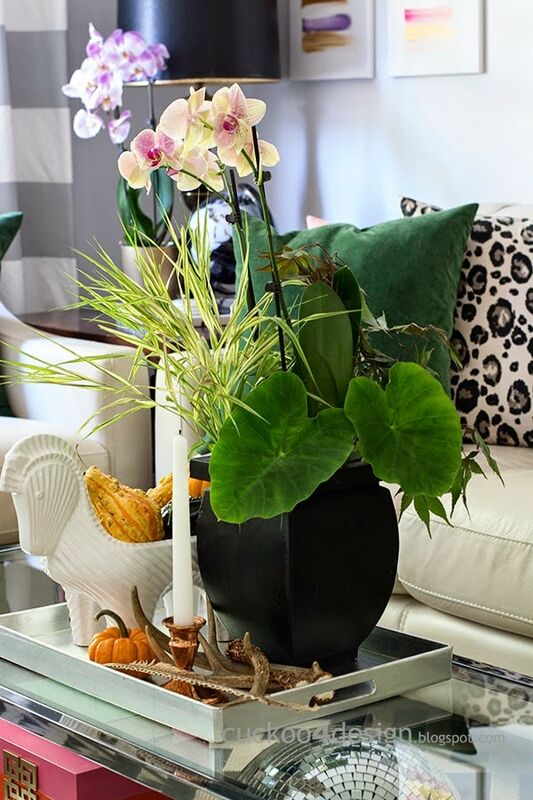 Love your simple decor for fall! 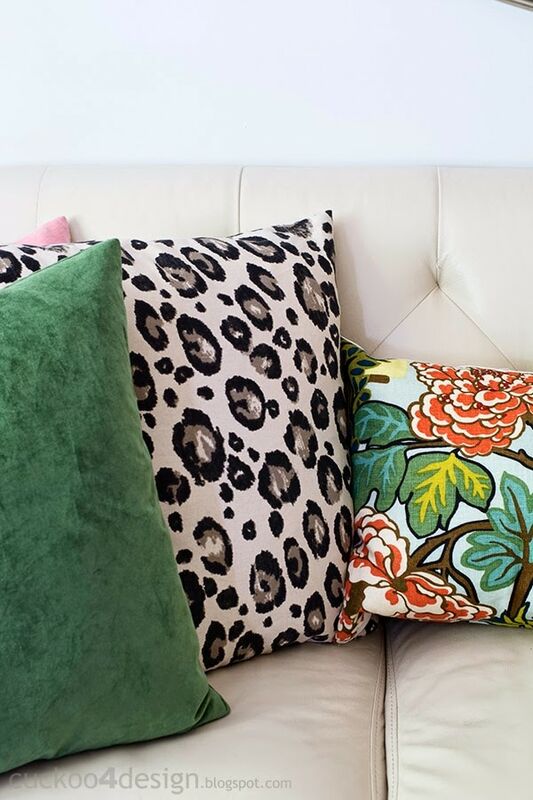 The combo of the leopard and green pillows is so pretty! That animation was great Julia! 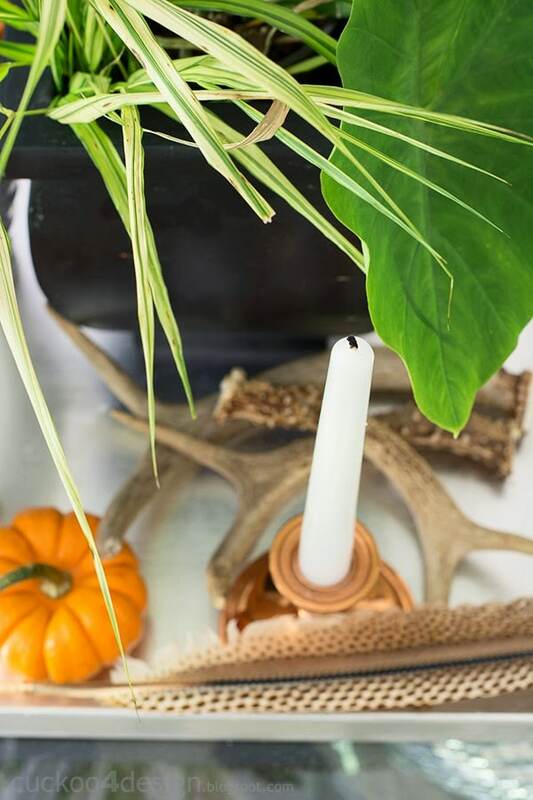 Love your simple fall decor.